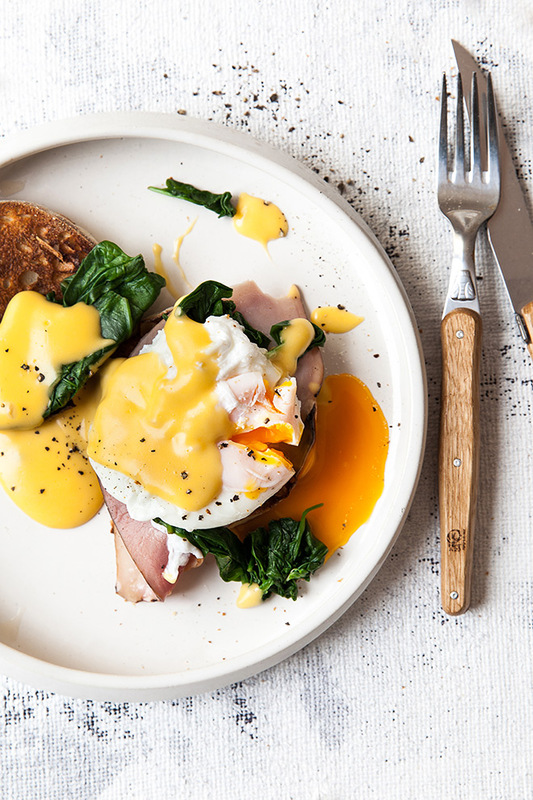 Eggs Benedict done right is one of the (many) reasons we love brunch so much. 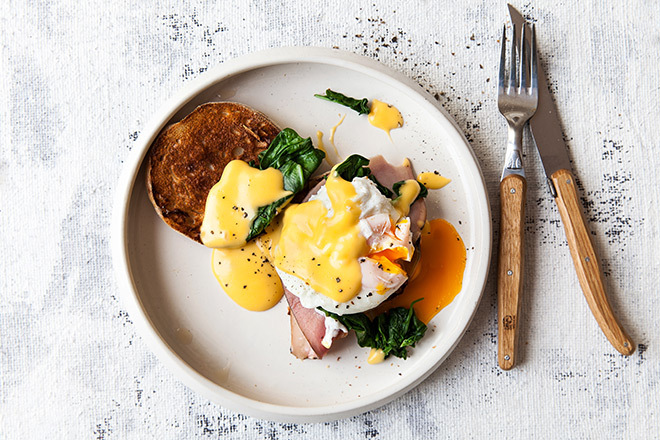 This combo of buttery, delicious hollandaise sauce and that perfectly poached egg is a quintessential breakfast we’re always happy to spot on the menu. Better yet, is enjoying and sharing it at our own breakfast table with our favourite people. That’s why we’re sharing this foolproof recipe. Pair it with a little know-how and you’ll be the Eggs Benny Champion before the next brunch commences. 1. 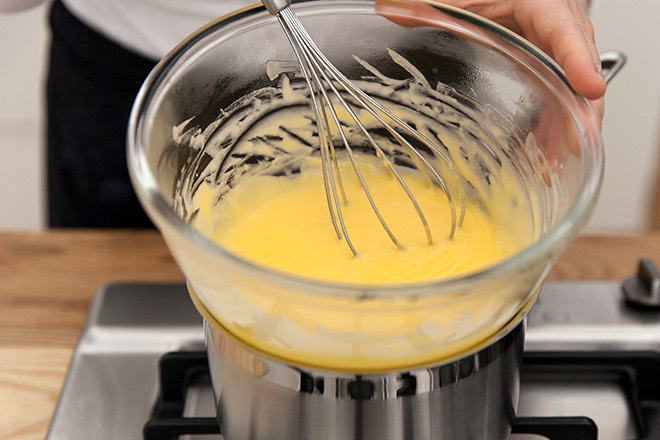 To make the hollandaise sauce, place the yolks, butter and 2 tablespoons of water in a heavy-based saucepan. Turn the heat on low and start to whisk. The butter will melt as the sauce heats up. You don’t want any steam coming off your sauce as this means it is too hot, so a good trick is to make sure the sides of the pan are cool enough to touch at all times. Never leave the pan unattended. 2. Once all the butter has melted turn the heat up to a medium-low temperature and whisk until the sauce has thickened. 3. Add lemon juice to taste, season well with salt and pepper. Pour the mixture into a glass bowl and leave over a pan of kettle-hot water whilst you make the eggs. Give it the occasional whisk to make sure the sauce doesn’t separate. 4. Now, for the poached eggs. Heat half a saucepan of water on a medium heat. Once simmering, reduce the heat to very low and the odd simmering bubble. Add the vinegar to the water. 5. Crack an egg into a saucer or small bowl. Swirl the water in the pan in a clockwise motion with a wooden spoon, drop the egg in the centre and let the water swirl it around to form a small ball. Time for 2–3 minutes for a soft egg or 4–5 minutes for a medium/hard egg. Using a draining spoon, remove the egg and place on a chopping board to drain any excess water. With a sharp knife, slice off the tail of your poached egg to neaten things up. 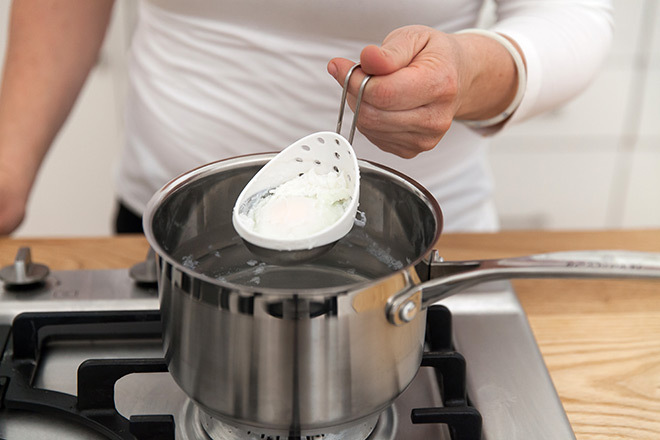 If this all sounds like too much fuss, try out an egg poacher from our egg tools range for super easy cheat’s poached eggs. 6. Whilst poaching the remaining eggs, toast your bread or muffin of choice. 7. To assemble your final Eggs Benedict, place the ham on the toast. We went with spinach for this one, which technically makes it an eggs Florentine, but we couldn’t resist. Top with a poached egg, then a large ladle of your tasty hollandaise sauce. If you’re serving yours with asparagus, or even green beans, place those on the side of the plate and give them a drizzle of hollandaise too. Grind over lashings of black pepper and serve. Move over granola, indulgent weekend brunches, here we come. We’ve heard that ultra fresh eggs don’t even need vinegar for a poached egg to come together. If you’ve had any luck with this, let us know. Also, if you’re a fan of deliciously decadent food, check out Franck Dangereux’s online cooking course on French Classics. It’s eggcellent.